This is an introduction box. Use this to call out critical information. If the reader ignores the information in this block then the results could be disastrous. Use this to call out information that is very important but not critical. This is a tip box. Provide power user or short cuts tips here. Add additional information that you want to call out but that doesn't fit into any of the categories above. 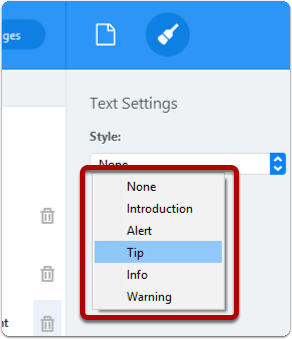 Click inside the text block that you would like to style. 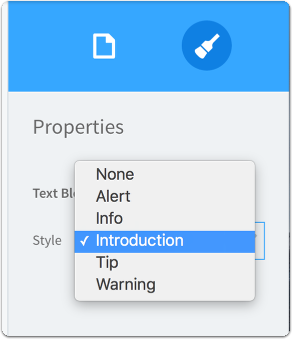 Use the Style menu to choose a style for the text block. 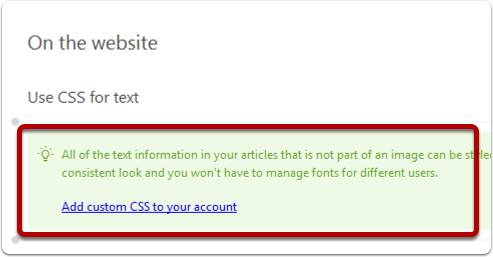 The text block will update with the selected style. Prev: Which text formatting options are available? I love this new feature! Only issue I have is that the icons don't appear correctly after pushing to Zendesk. Is there something I need to do on the Zendesk side to affect this?